Taiwan has been under a lot of pressure lately. After losing a diplomatic ally Dominican Republic at the beginning of May to China, Taiwan has been excluded from the World Health Organization’s annual assembly that kicks off tomorrow (May 21), despite calls from the US, the European Union and Taiwan’s remaining diplomatic allies. WHO head, Director-General Tedros Adhanom Ghebreyesus, even said that because of China’s opposition, Taiwan would not be allowed to participate. It’s a very shameful and absurd situation that a country of 23 million can be excluded from a world gathering to discuss vital health issues simply because another much bigger and powerful country claims it and uses its clout to dissuade multilateral bodies from acknowledging it as a country. Taiwan basically doesn’t exist as an independent state, even though in reality it is very much so, in the eyes of a lot of countries, corporations and multilateral world bodies. As this excellent article states, Taiwan exists in a “unique diplomatic purgatory.” While unofficial ties exist, such as with the US and , the problem is that Taiwan cannot participate in or be a member of world bodies such as the WHO, the UN, or even the ICAO (International Civil Aviation Organization), which oversees global aviation standards and practices. 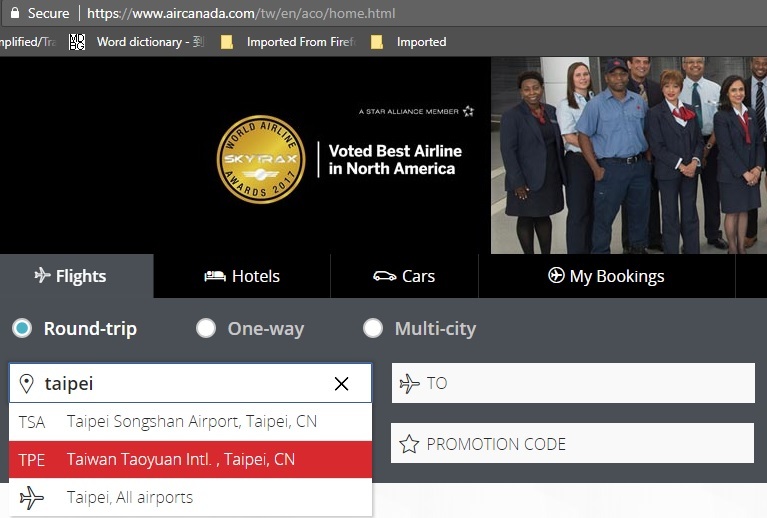 This lack of recognition even extends to international companies, especially airlines such as Air Canada, which recently changed its listing on its website of Taipei, Taiwan to Taipei, China, therefore implying Taipei (the capital city of Taiwan) is part of China. British Airways, Lufthansa, and Etihad had also made this change earlier this year. It is very disappointing that Air Canada did so as Canada has always been a very progressive country with good ties to Taiwan. I actually regret flying on Air Canada last year when I visited the country and if I had to repeat the trip, I would certainly consider flying on a Taiwanese airline even if it were to be more expensive. China also tried to pressure American airlines into changing how they listed Taiwan, but thankfully the White Houses responded by calling it Orwellian nonsense. There’re lots of problems with the current American government, but when it comes to dealing with China, they’ve actually done a few things well. The changing of Taiwan’s name by international organizations was actually happening much earlier, as I personally experienced when a charity I used to donate to sent a letter to my Taiwan residence listing Taipei as a “Province of China.” I tried to leave a message on their Facebook account but never got a reply. I’ve recently contacted them again by Twitter and email so I’m hoping to get a response. I don’t doubt they do valuable work, which is why I donated to them in the first place, but their listing of Taiwan as a “Province of China” is very blatant and false. I haven’t donated to them since and won’t consider doing so until they stop listing Taiwan as a “Province of China”, but don’t worry, I can still help “save the children” by donating to other worthy organizations. The growing danger is that while right now, many organizations, companies and world bodies are forced to recognize Taiwan as part of China and not its own country, in the future, China can push this to justify military invasion and attacks.